A - Hillend Campsite (Llangennith). B - Pitton Cross (Rhossili). C - Carregwlyd Campsite (Port Eynon). E - Nicholaston Farm (Nr Three Cliffs / Tor Bay). The Gower peninsula, Britain's first designated area of outstanding natural beauty, extends 20km westwards from the city of Swansea. The peninsula is an ageless delight, with its attractive landscape of cosy villages, farms, castle ruins and common land, bounded by 40km of awesome coastline and world renowned beaches. Situated on the western edge of the peninsular, you will find the most breathtaking of all Gower's beaches, Rhossili Bay. 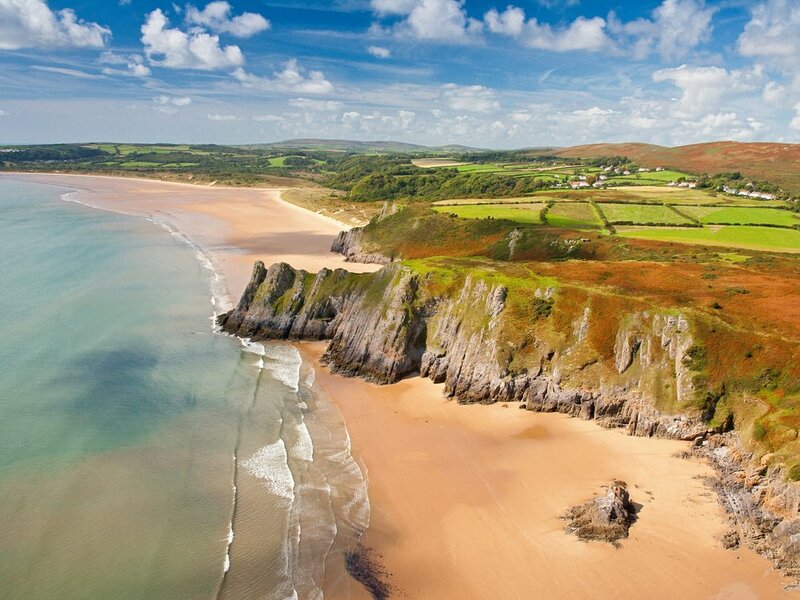 From Worms Head in the south, to the tidal islet of Burry Holme to the north, the three mile sweep of golden sands is a constant reminder of the splendour of Gower. It is here, at the foot of Rhossili Down, 200m from the beach, embraced by farm and moor land and an extensive sand dune system, that you will find Hillend. Pitton Cross Caravan and Camping is a family run touring park on the Gower Peninsula in South Wales, and is approximately 16 miles from Swansea and being the only caravan and camping park near Rhossili and Worms Head. Catering for touring caravans, tents and motor homes All pitches are on level ground, well spaced around the field edges, and sited through out 6 paddocks. There are both 'family only' and 'dog free' areas and several hard standing for motor homes. The 300 pitches are non-marked or specified, enabling visitors to choose their own spot in relation to the facilities and the beach. The camping area at Greenways Leisure Park consists of four fields and offers ample space for campers to pitch up throughout the camping season, which runs from Easter or the 1st April each year to the end of September each year. Most of the camping area has Easterly views directly down to the beach, across to Three Cliffs Bay over the marshlands or across the valley over to Cefn Bryn & the village of Reynoldston. Indeed you can see the seas right around the point to the South West and even right across the Bristol Channel to the Devon coast and Illfracombe. There is a completely refurbished camping facility block project in readiness for the 2010 camping season. The new facility block has all new showers WCs and wash hand basins, heated by 2 new high efficiency Rinnai Infinity (heavy duty) water heaters. There is to be a sluice facility, an ironing and laundry area and an area for dishwashing. The new block will cater for the mobility impaired with wheelchair access. The whole project is aimed at being family friendly. For those of you who need to access your emails and such whilst away from home, we are also working together with an excellent telecoms company in order to supply wireless internet access across the park by creating a WiFi hotspot at Greenways. Named as the “Number one view from a campsite in the World” by The Independant in 2006. This campsite is situated overlooking Three Cliffs Bay with a public footpath leading down to the beach. The public footpath will take about 10 minutes descending to enjoy the beautiful golden sands. There are also some 52 acres of cliff-land which is ideal to exercise dogs. Families and couples are welcome, and can enjoy a warm friendly atmosphere with many visitors returning year after year. 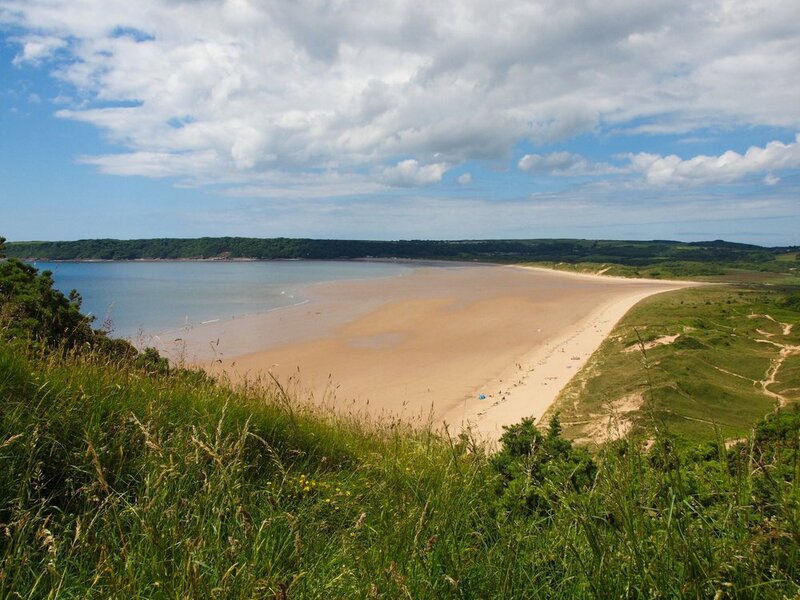 Beyond Three Cliffs Bay, you have Tor Bay and Crawley Woods, also, Oxwich Bay whose sandy beach is always popular with young families.